UNAC Statement on the Proposed Withdrawal of U.S. Forces from Syria – Stop the Wars at Home and Abroad! President Trump announced, this week, that he is going to withdraw all troops from Syria immediately. It is unlikely he will end all military actiity in Syria. There is too much invested in the region. UNAC strongly supports any decision that will bring us closer to an end of the illegal 5 year occupation of Syria by U.S. forces. We further call for an immediate end to U.S. bombing Syrian territories, U.S. funding, arming and training mercenary irregulars in Syria and all other U.S. actions that perpetuate the vicious assault on the people and the sovereignty of Syria. UNAC demands that U.S. troop withdrawal be immediate as the U.S. has been promising to withdraw troops from Afghanistan for 17 years, yet they have not done so. The President’s cabinet, his trusted generals, most of congress (both right and left) and the press have denounced the President’s decision for a variety of reasons, none of them pertinent to the security of the U.S. population and none that provide meaningful support for the people of Syria. In fact, the only times that Trump has received universal approval during his presidency have been the times when he bombed Syria prior to the investigation of chemical weapons events that later were shown to be false flag operations by Al Nusra and ISIS, reported through the discredited White Helmets organization which is primarily funded by the British and US governments. UNAC has consistently denounced and opposed this endless warmongering by powerful elites. The announcement of imminent withdrawal of U.S. troops from Syria has invited various responses from the analytical and activist communities. By and large there are concerns reflecting the hysteria promulgated by the mainstream media and congressional representatives who are allied with the military industrial complex. Their concerns are related to possible harm done by the abandonment of locals through the exit of U.S. troops. They are asking the wrong questions. UNAC asks will us forces really leave? The U.S.has thousands of troops at Camp Saliyah near Doha, Qatar, a Muslim Brotherhood stronghold, along with the forward base of U.S. military leadership in the Middle East, and they continually bomb locations in Syria and Iraq from there. UNAC demands that Camp Saliyah must be dismantled and Centcom restored to it’s domestic home at MacDill Airforce Base in Tampa, Florida. It is not clear that the President has the power to remove troops from Syria against the wishes of Congress and the deep state institutions that surround him, or whether policy in the region has just collapsed. It is an open question whether the US will really remove its forces from Syria and end support for other wars in the region, for instance the horrific war against Yemen that has been prosecuted with full US support. Many congressional Democrats are opposing this war at the moment, while the Republicans and Trump’s inner circle support it. Support for Palestine remains in the realm of the unspeakable across all political elements in the US. Ending the war on Syria is an important first step of disengagement from these wars. U.S. disengagement must occur in the interest of stability, sovereignty and self determination of all nations across the globe. We need a movement independent of both political parties and specific individuals in government as well, to pressure the U.S. state across all elements to end these horrific wars as well as the interventions in Africa and Latin America and the campaign of harassment against Russia and China. Only a truly independent movement can stand firm in the face of ever shifting political and economic manipulations. The reactionary ISIS forces, who held large swaths of Syria and tens of thousands of U.S. trained and supplied foreign mercenary forces, have been defeated. Despite 4 years of U.S. bombing and 8 years of criminal intervention, Syria has prevailed and successfully restored a sovereign area that includes most of the densely populated areas, with the largest outstanding portion of the country occupied by U.S. forces and proxies. The reactionary ISIS forces, who held large swaths of Syria and tens of thousands of U.S. trained and supplied foreign mercenaries have been defeated. Trump’s claim that the U.S. defeated ISIS and Al Nusra terrorists in Syria is absurd in light of the facts. While Syria and her allies fought and vanquished an army of terrorists, the U.S. continues to shelter some ISIS mercenaries in the occupied area today. All U.S. contractors and mercenaries my immediately leave with the troops. Forces are being removed to Iraq, where they will be prepared to return to Syria ‘as needed. UNAC demands the complete withdrawal of troops, mercenaries and military contractors from the region. Since the end of World War II, regime change interventions and war making on sovereign states has been a crime under International Law. The U.S. has, for this entire period, supported one regime change initiative in Syria after another. 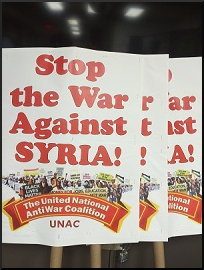 UNAC supports Syria’s resistance to this latest criminal act and the survival of Syria as a multi-national, multi-ethnic, multi-religious state! The U.S. intervention was always illegal and uninvited. And now it is beyond time to leave. Indeed, it is likely the current decision on U.S. presence in Syria, if it is not overturned, will fail to remove all troops from Syria including military contractors and special forces there to guard resources of interest to the U.S. UNAC demands that all U.S. interventions is Syria be ended immediately. Whatever factors bind the U.S. to continue this war and any plans in process to continue it by other means require that UNAC and all those who care about Syrian sovereignty and self determination continue to demand U.S. withdrawal of all forces and means from Syria. Material reconstruction and political regeneration are ongoing in Syria, and must be allowed to proceed unhindered by the interests of the United States or any other foreign state. Syria for the Syrians! UNAC demands that U.S. leave Syria NOW! UNAC demands Sovereignty and Self Determination for the people of Syria and Iraq! U.S. out of Syria! U.S. Out of Iraq! U.S Out of the Middle East! Next Post:Development vs. destruction: China and the U.S.